One of our Springtime have-to-dos is planting seeds. When we plant seeds, we read books about seeds and plants and growing things. 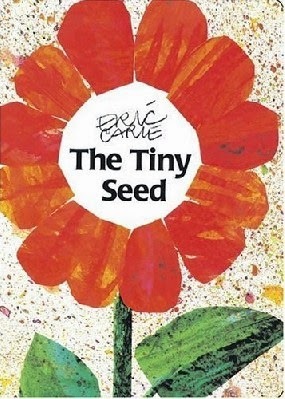 One of the books that we read is by one of our favourite authors, Eric Carle. 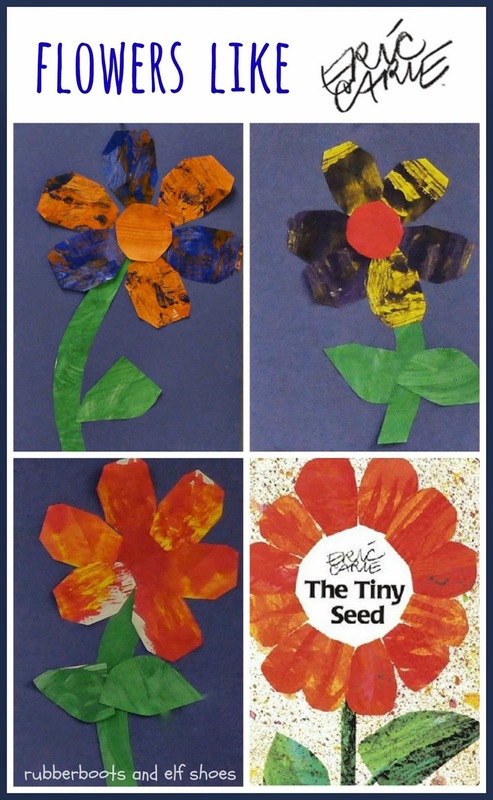 Eric Carle flowers just begged to be re-created kindergarten style. We read the story and talked about the plant life cycle. Then we looked at the art. We looked at the petals of the tiny seed's big flower. We could see a couple of colours - yellow and red - and a bit of orange where they had mixed together. We could paint our petals like that too. My last year's student teacher (who created this project) had the brilliant idea of painting each half of a piece of paper different colours, and then folding them together to mix the colours. The papers were opened up to dry. 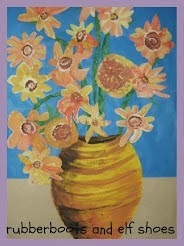 The kids thought that the papers looked okay - but were not sure that they would make beautiful flowers. Then they saw the paper cut into petals. That looked a bit more promising. Time for the collage fun. and finally, the artist signs his or her name. Finally they are hung in the hallway gallery. Last year some very hungry caterpillars found our flowers. Hoping that they do this year too. Click on the photo. Love this. Great way to mix the colors and create the petals. Thanks. I thought that the petals turned out very Eric Carle-esqe. I was just thinking of busting out my Eric Carle books. Thanks for the inspiration! It does seem to be the Eric Carle time of year. Just read this today and made scrapbook paper flowers! Love Eric Carle. I bet that they look amazing. What an awesome idea! 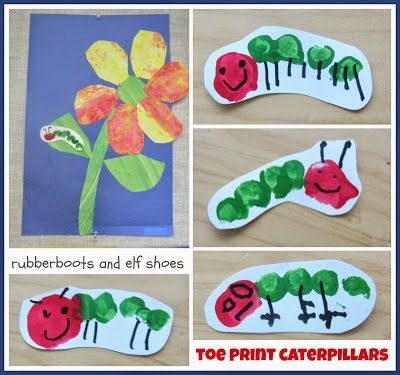 I have seen so many neat craft projects to do with the kiddies based off of Eric Carle's books. 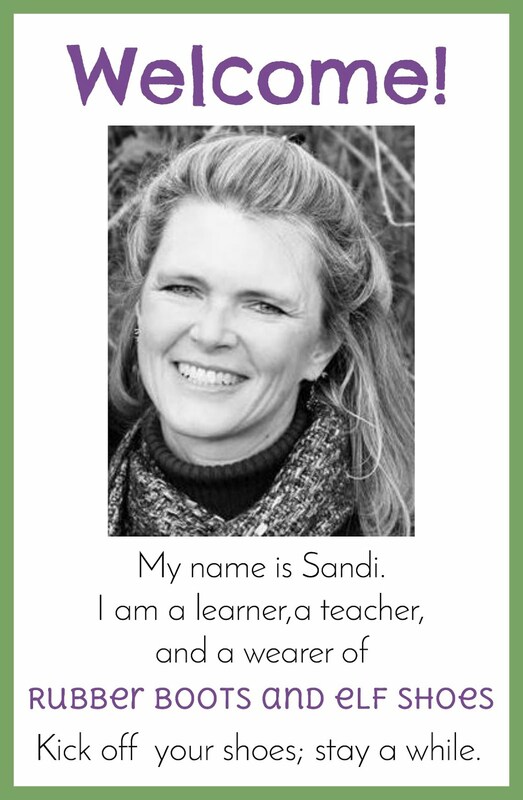 Thanks for sharing at What I Learned Wednesday! 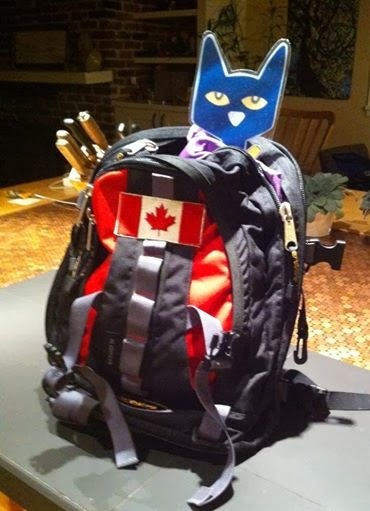 Eric Carle and his work have inspired so many wonderful projects. I inadvertently deleted this comment. Here it is. Oh how pretty. I love them! Thank you for sharing at Sharing Saturday. my reply: Thanks. And thanks for hosting the link every week. I have some clarifying questions. Did the students cut the petals out? Who painted the stems and centers? Did you use sponges to paint with to acheive the streaks? These are AMAZING! I love the ideas and just had some clarifying questions. -What did you use to paint with to achieve the streaks? -Who painted the stems and center pieces? -Who cut out the petals? 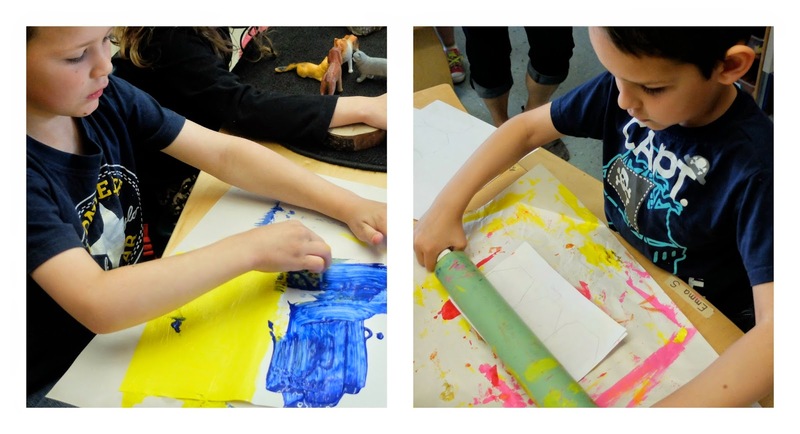 - We used tempera paint - the streaks were created when we folded the paper together. - The kids painted the stems and centre pieces with sponges. - An adult cut out the petals.